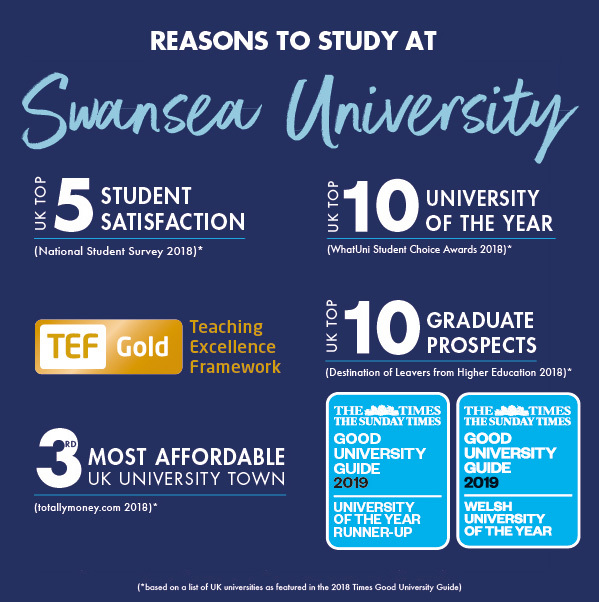 We provide undergraduate and postgraduate pathways at Swansea University, which is in the UK top 30 in the prestigious Times and Sunday Times Good University Guide 2019. Offering a modern and dynamic educational experience, The College is committed to providing academic and support services in an environment that encourages you to achieve excellence in your studies. The College offers academic pathways in partnership with Swansea University that lead to undergraduate and postgraduate degrees. Our unique approach to education transforms international students into Swansea University graduates and lifelong learners. At The College, you will be expected to work hard, but you will also have plenty of opportunities to enjoy your studies and the many social activities available both in Swansea and the surrounding area. Small classes with personalised attention: We offer a personalised and supportive educational philosophy that encourages students to reach their maximum academic potential. Academic classes offered by The College usually have no more than 35 students. A Swansea University student from day one: From the first moment of enrolling at The College, you will be a Swansea University student with a student ID to match! On campus: Your studies will take place on Swansea University's stunning seaside campuses, enabling you to join in the exciting events happening across the University! Five intakes per year: Start your studies at a time best suited to you with intakes in September, January, May, June and even a November start date. Foundation options: Our extended semester Foundation options allow entry with lower English levels. Dedicated on-campus accommodation: Students of The College will have a dedicated residence on the Bay Campus, all rooms have their own bathroom, are very close to the teaching building, and will be housed with other students of The College. The residence was opened in January 2019, and all of our students are guaranteed accommodation. Value for money: We can offer some of the least expensive lifestyles of the UK Top 30 research Universities. The College provides the same excellent standard of education, without the price tag. 24-hour student support: Our Student Support team can offer advice and help 24 hours a day, seven days a week. We can organise airport pickup, accommodation allocation, provide orientation and advice on where to try the best food in the city! Superb student lifestyle: Our students are able to take part in all University events in addition to special activities reserved only for you. From opportunities to see Premier League games to trips around famous historical sites throughout the UK. The College is committed to helping you achieve your goals by providing many support services. As a student of The College, you will have access to all Swansea University's services. We encourage you to use the support services available and contact our friendly staff for advice and assistance when you need it. Once enrolled, all students will also have immediate access to the online student information, which includes all timetable and academic information as well as extracurricular information from the Students’ Union and The College's support services and academic teams. Please note: all of the above are subject to availability and may incur an additional cost. If you are interested in getting involved in sports and societies, Swansea University is the perfect university for you. The campuses offer a wide range of recreational and sport facilities for you to use, including a gym, playing fields, sports halls and a 50-metre swimming pool. Being part of sports and cultural societies while at Swansea University will open up many social and networking opportunities for you. We encourage our students to participate in such activities as much as possible. The Bay Campus is home to The College's dedicated teaching and living spaces. The Bay Campus boasts some of the best learning facilities in the UK and is one of the only University campuses in the world to have direct access to the beach. Our new academic building has 18 teaching rooms, designed especially for our smaller group teaching style, as well as computer labs and study areas offering choices for individual and small group study. With space for social and cultural activities, it is the centre of our learning community at the Bay Campus. At the heart of the Bay Campus stands the Great Hall. This £32 million facility houses lecture theatres, break-out teaching spaces, a 700 seat auditorium and café bar with stunning views over Swansea Bay. The College of Engineering is recognised internationally for its teaching and research with world-class Research Centres and a sustained investment programme, providing students with outstanding resources and facilities. The School of Management has a thriving student community drawn from across the globe. The School has a dynamic research culture centred around a number of research groups and our students benefit from the expertise of our world-leading academics who are involved in teaching at all levels. You will find subject-specific learning resources, study spaces, computers, loanable laptops, USB charging points, staff and spaces to support your independent learning and professional development. Access to the full range of e-books and e-journals and 850,000-item print collection is available through delivery from our other sites. A world-class computational science research centre is due opened in September 2018. The courses are structured to provide a solid understanding of current micro and macroeconomics, finance and banking principles, analysis and regulation, after which students can select courses of particular interest. For students who have an existing vocational qualification (eg: Horticulture, Jewellery making) and with an IELTS equivalent 6.0 (5.5), we are able to offer our 2-semester pathway option. Computer Science affects every aspect of our lives, placing increasing demands on education, business, and industry to ensure that the workforce of the future is equipped with the skills necessary to thrive in the Digital Age. Computer Science at Swansea is at the heart of the technological innovation that is redefining the way we live, learn, and work. Engineering at Swansea University is taught in a cutting-edge learning environment using state-of-the-art teaching facilities. The university pioneers technological progress in both traditional and emerging engineering disciplines, working in partnership with major industrial companies. All engineering activities at Swansea University are driven by, and based on, world-leading research. This programme provides students who have an interest in accounting or finance with a solid academic background which will prepare them for the workplace or postgraduate training. Students will acquire key technical accounting and finance skills and will also develop their knowledge of a broad range of topics which will enable them not only to understand financial information but also how to link it to broader decision making. The Accounting and Finance programme at Swansea University can provide up to 9 exemptions from the ACCA professional accreditation, the maximum exemptions available from a UK academic degree. Management is about making decisions and getting the most from people at every level in all types of organisations. Business Management and Economics at Swansea provides a number of core subjects, plus a number of specialisms or a number of specialists subjects, creating an academically rewarding educational experience that provides an excellent foundation for a broad range of careers. Computer Science is an integral part of our lives. Developments in IT will continue to place increasing demands on education, business and industry so that the workforce of the future is equipped with the necessary skills to thrive in the digital age. Computer Science at Swansea is at the heart of the technological innovations that are redefining the way we live, learn and work. Education is a forward-looking, research-led discipline concerned with policy and practice from a global perspective. It is a rapidly growing area of study that draws on the disciplines of psychology, philosophy, history and the social sciences to focus on understanding how people learn and how structures of education operate to foster life-long learning and personal development. Designed for both UK/EU and international students, our BA (Hons) Education programme considers education in a wide context, not just within formal primary and secondary school settings, but also Further/Higher Education, social services, local and national government, and education within the community. Swansea is the only University in the UK to offer the unique BA Honours English - Chinese Translation and Interpreting programme to students with a native or near-native command of Chinese Mandarin, plus a high level of competence in English as a foreign language. From small law firms to the United Nations International Court of Justice, the legal profession shapes every aspect of our society, politics and economics. Law regulates how we buy and sell goods and services, and how we govern ourselves. It defines how we prosecute and defend, and how we secure the rights of people who may not be able to protect themselves. All of Swansea's Bachelor of Law (LLB) courses are qualifying law degrees. Learn about crime, the criminal justice system and cutting edge themes in criminological debates from leading experts in the field. Mathematics is often challenging and always rewarding. It is one of the most universal of disciplines and is the basis on which the modern world is built. Science and business depend on mathematical foundations and mathematicians, therefore, play an essential role in our society. Mathematics is both ancient and modern; you will examine the number theory that Pythagoras studied around 2,500 years ago as well as the financial mathematics that the highest flyers on Wall Street rely on. At Swansea, our teaching, and research explores the history, theory and practice of media, film, journalism and public relations. Research is developed through the two main groupings of European Film and Identity, and Media History, Theory and Technology, together with overlapping clusters exploring Journalism and Global Media. Politics is not just about studying government institutions and international relationships; it is a discipline that has explored different visions for a more just society for thousands of years and continues to address some of today's most pressing challenges. Politics and International Relations students at Swansea University investigate issues such as genocide, financial crises, the role of the United States and the United Nations, and the future of political devolution. The course also asks where threats to our society come from, and whether we can prevent them. Psychology is the scientific study of the brain and behaviour. Students will study the psychological and neuroscientific processes that underpin daily activities such as thinking, reasoning, memory and language, learn the consequences of brain injury and how to improve health-related behaviour. Science at Swansea University incorporates a range of subjects, from biology through to zoology. All these subjects bring together a range of research centres and provide an understanding of the world we live in. Swansea University is renowned for its research excellence in aquaculture, climate change, geo-informatics, geography, glaciology and zoology. These degrees will provide you with a broad understanding of medicine and health care, social policy and welfare issues and how we experience them as a society. Sports scientists help athletes to be fitter, faster, stronger and more mentally prepared to maximise their performance. Sports Science embraces science, technology and medicine to help teams and individuals gain a competitive edge over their rivals. The demand for expertise in this discipline is increasing, both in exercise settings and high-performance sport. Sports Science at Swansea is a professionally relevant programme that explores the factors that influence participation and performance in sport and exercise.